Homes that contain French doors (also known as patio doors) could possibly be left vulnerable if they don't have adequate security in place, a locked door alone isn't sufficient, entry by force is particularly common at the rear of the property, thus if your property has French doors fitted to the rear or side of the building, then it's recommended to consider reviewing your overall security. Why use a Patlock device? 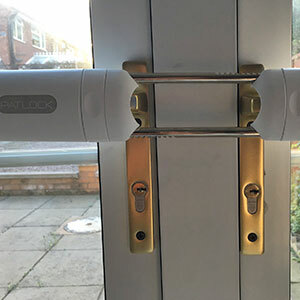 The patlock device provides extra piece of mind to the overall security of your patio doors, it's designed for internal use only, therefore if anybody did manage to successfully snap your locks which can be the case if you are unsure what type of lock cylinders you have fitted, then the patlock will most likely save the day because it prevents the door from opening, prolonging an attempt of forced entry, not only that it acts as an excellent visual deterrent which could possibly deter attempts of a break in. A Must have security device for French Doors. Having the correct sized lock cylinder that's anti-snap, anti-drill and anti-pick fitted used in conjunction with the Patlock device will provide an excellent form of security, if your budget allows you to opt for the Ultion locks by Brisant this would provide you with the absolute best burglary prevention. Our locksmiths in Leicester are on standby 24 hours a day 7 days a week to provide you with the very best service possible to include a fast response time, and we come prepared with all the kit necessary to complete the job there and then.